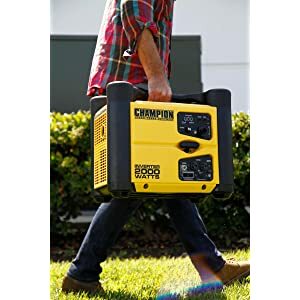 The Champion Power Equipment 73536i 2000-Watt Portable Inverter Generator is the perfect combination of versatility and innovation. 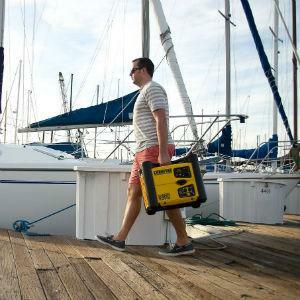 At only 48.5 pounds, this inverter is ideal for camping or tailgating. Power items around the RV like lights or TV or provide backup power for a few basics like lights, microwave, TV, modem/router or phone charger. This unit is not recommended for emergency home backup for air conditioners, stoves, furnaces or sump pumps. Power up with the reliable recoil start, plus Cold Start Technology ensures a quick start in cold weather. 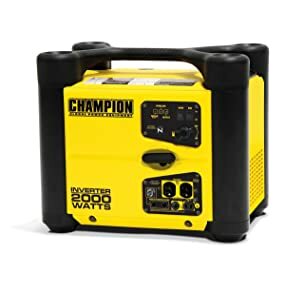 Featuring a patented, space-saving stackable design, this Parallel Ready inverter can connect with another Champion 2000-watt inverter for 30 amps of power. The optional Parallel Kit is designed to integrate seamlessly between two stacked inverters and comes with a standard 30A RV outlet. The reliable 80cc Champion engine produces 2000 starting watts,1700 running watts and up to 9.5 hours run time at 25% load when the 1-gallon tank of gasoline is full. Including two 120V 20A household outlets (5-20R) and a 12V DC outlet, this inverter operates at 53 dBA from 23 feet – about the same noise level as a dishwasher running in the next room. Champion’s Inverter Technology includes smart Economy Mode, which can reduce the electrical load, providing quieter operation, extended engine life and better fuel economy. Confidently connect your sensitive electronics since this inverter produces Clean Power (< 3% THD). Designed for safety with a low oil shut-off sensor, this inverter has a 0.4-quart oil capacity and comes with a bottle of 10W-30 oil so all you need to buy is the gasoline. Fully assembled with hassle-free setup, the built-in carrying handles make transport a cinch. Buy this EPA certified and CARB compliant generator with confidence – Champion Support and our nationwide network of service centers will back up your purchase with a 3-year limited warranty and FREE lifetime technical support. Champion Power Equipment is a market leader in power generation equipment. Champion has years of experience providing dependable and durable power products designed and engineered in the US for the North American and world markets. For work, recreation or home use, Champion products are the standard of performance excellence. We make the power that makes your life easier. Champion provides exceptional customer service. A staff member would be more than happy to help with any questions or concerns, give us a call today. 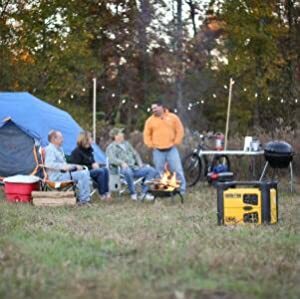 The Champion Power Equipment 73536i 2000 Watt Stackable Portable Inverter Generator is a quiet and lightweight addition to your RV, your next camping trip or a weekend of tailgating. It is perfect for powering items around the RV or campsite like lights, TV, small refrigerator, slow cooker or coffee maker. (Note: this unit is not recommended for emergency home backup power and will not power air conditioners, stoves, furnaces or sump pumps.) The inverter produces 2000 starting watts and 1700 running watts. The unit features a patented, space-saving stackable design. With parallel capability, the inverter has the ability to connect with another Champion 2000 Watt Inverter for 30A of power. - 1700 running watts/2000 starting watts. - Up to 9.5 hour run time at 25% load. - 53 dBA at 23 ft.
- Easy pull recoil start. - Low oil shut-off sensor. - USDA approved spark arrester. - True Sine wave inverter technology. - Economy mode to save fuel. - Built in carrying handle. The Champion Power Equipment 73536i 2000 Watt Stackable Portable Inverter Generator is operates at 53 dBA from 23 ft. 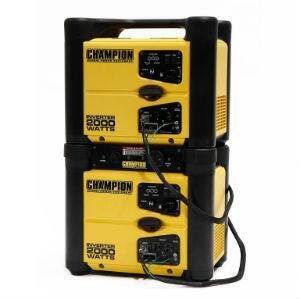 The Champion Power Equipment 73536i 2000 Watt Stackable Portable Inverter Generator weighs less than 50 lb. The optional Champion 2000 Watt Parallel Kit is designed to integrate seamlessly between two stacked inverters and comes travel-ready with standard 30A RV outlet with enough power to start and run a 15,000 BTU RV air conditioner.